My studio is in full production mode right now; I'm enjoying a surge of creativity that's been inspired by the beauty of fall. The quality of the light in autumn is so inspiring; golden and warm. 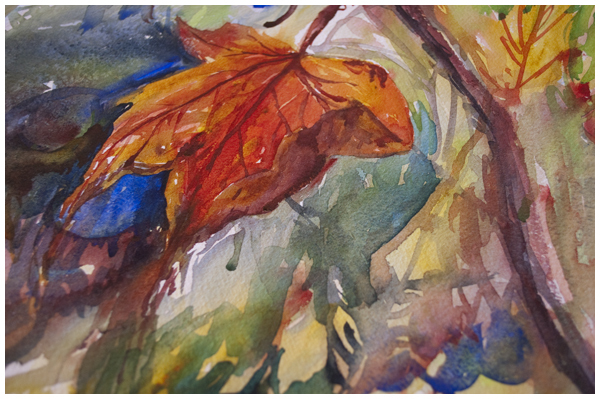 Every leaf seems defined and haloed by sun on a September afternoon, and it's irresistible to a painter's eye. I started painting leaves on the weekend. The painting above was feeling a little too disorganized, kind of a chaos of colour and line, but I snapped a detail photo of just a piece of it before I abandoned it, and when I saw this cropped version on the computer screen, it took my breath away. Paintings don't always get finished. Paintings don't always get finished quickly. I can be incredibly busy painting and full of inspiration and have very little to show for it; letting the kids sleep in and start school later so I can squeeze in a few minutes painting in my bathrobe, stopping in passing to lay a few strokes on the way out the door, setting a painting aside because maybe I'll know how to finish it later. Right now I have three leaf paintings in various stages of completion/abandonment, a stack of newly completed landscapes to be catalogued and stored neatly, and on the easel right this minute is a sketch of a sunlit forest that I can't stop looking at. I am so blessed. In delighting in my own handiwork, that sentence from Genesis takes on a personal meaning; "And God saw that it was good." People tell artists, "You have a gift," and it's true, but not in the sense I used to think - a gift to give the world - but it's a gift given to me. Like buried treasure, as I unwrap it and bring it out into the light, it becomes more valuable and precious as I explore what it truly is that I have been given to hold.